As several fact-checkers immediately pointed out, Kavanaugh was pretty clearly referring to the argument made by the plaintiffs in the case (Catholic hospitals and an anti-abortion group called Priests for Life) in using that language, not necessarily making his own characterization. “Abortion-inducing drugs” is a confusing term in any event; it seems to refer to Plan B contraception pills. In his actual dissent in the case, Kavanaugh characterized the plantiffs’ argument as objecting to insurance coverage of “abortifacients,” a more general term referring to both drugs and devices (most notably IUDs) that while commonly thought of as contraceptives are treated according to some conservative religious viewpoints as producing an “abortion” of a fertilized egg by preventing its implantation in the uterine wall. What Harris was clearly trying to do was to associate Kavanaugh with that rather extreme point of view, which would make contraceptives vulnerable to some future hypothetical abortion ban. Harris’s video omitted Kavanaugh’s introductory words — “they said” — which pretty clearly indicate he was quoting the plaintiffs and not himself describing Plan B as an “abortion-inducing drug.” And thus the fact-checkers adjudged the California senator as having made a seriously misleading accusation (the Washington Post awarded her “Four Pinocchios”; PolitiFact labeled it “False”). Harris subsequently released the full video while arguing that Kavanaugh showed his extremist hand by not going out of his way to dispute the “abortion-inducing drugs” language. In a Wednesday tweet sent after multiple mainstream fact checkers exposed Senator Kamala Harris’s inaccurate characterization of Supreme Court nominee Brett Kavanaugh’s confirmation-hearing testimony regarding contraception, Hillary Clinton echoed the false claim. So is this simply a matter of an unsuccessful partisan “hit” on Kavanaugh? Not if you look at the broader context of his impressive evasiveness during the hearings whenever the subject of reproductive rights came up. And the clear intentions of the president (who promised to nominate Justices who would overturn Roe v. Wade) and the conservative coalition (led by anti-abortion stalwart Leonard Leo of the Federalist Society, who supervised the vetting of Kavanaugh and others on Trump’s SCOTUS list, with every anti-abortion group whipping up support for Trump’s nominees) backing Kavanaugh, should all give the very strong presumption that he is hostile to reproductive rights. His rulings and writings — including his lionization of the constitutional jurisprudence of former Supreme Court chief justice William Rehnquist, a dissenter in both Roe v. Wade and the Planned Parenthood v. Casey decision that reaffirmed Roe — reinforce suspicions about Kavanaugh’s disposition, careful as he naturally was in the hearings to cloak his position (in the tradition of SCOTUS nominees declining to answer questions about specific cases past or future). Because of this, a big part of the confirmation hearings was a cat-and-mouse game in which Democrats (and strangely, one anti-abortion Republican, Lindsey Graham) tried to suss out indications of exactly how big a threat to reproductive rights a new conservative majority forged by Gorsuch and Kavanaugh might pose. And in that context, language like “abortion-inducing drugs” is indeed a big, flashing, red sign. It represents the viewpoint of those who want to ban not only late abortions, and all clinical abortions from the earliest stage of pregnancy, but contraceptive methods that work after fertilization. That would include the influential (if not very popular) “personhood” movement focused on endowing every zygote with full citizenship rights. Now it might seem implausible to assume that a worldly judge like Brett Kavanaugh would share such an extremist viewpoint. But it is, after all, the position of his church (if not of most American Catholics), which has clearly condemned use of the “morning-after pill” as a “chemically induced abortion,” and has fought for restrictions on in vitro fertilization clinics on the grounds that they destroy human embryos. And the very case that led to the current brouhaha over “abortion-inducing drugs” obviously involved Kavanaugh’s co-religionists. Democrats have pretty clearly made a decision not to do or say anything to suggest that they are questioning Kavanaugh’s religious views, even if they have a bearing on his constitutional philosophy generally or in cases involving life-and-death questions. Dianne Feinstein and Richard Durbin got into hot water in 2017 by closely questioning Court of Appeals nominee Amy Coney Barrett (reportedly a runner-up to Kavanaugh as Trump’s current SCOTUS pick) about the relationship of her own Catholic beliefs to her role as a judge (a topic Barrett herself had raised in an article earlier in her career). So leaping on language Kavanaugh used to discuss a case in which Catholics were advancing an extremist position on birth control probably seemed safer than talking about Catholic doctrine directly. In the end, Harris made a misleading argument against Kavanaugh, and then replaced it by stipulating a dubious standard of expecting the judge to go out of his way to attack the language used by a litigant in a case he had heard. 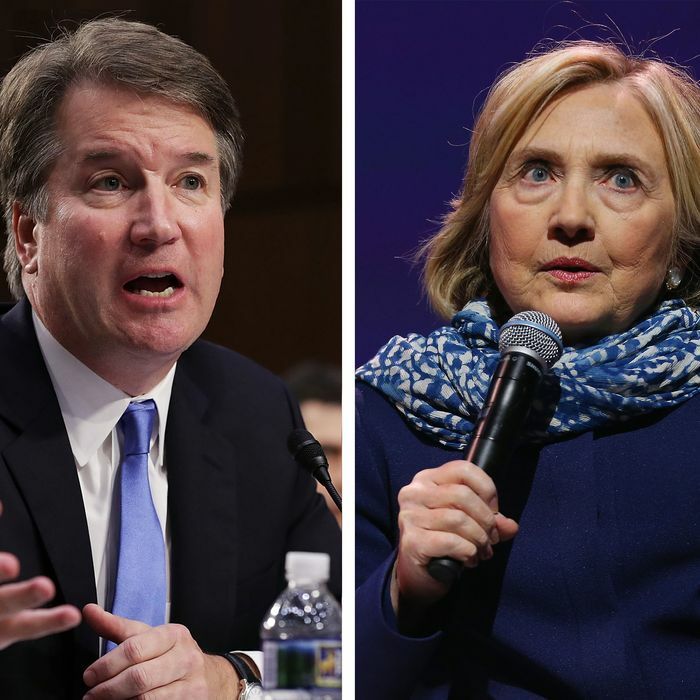 Clinton could have made any number of arguments about Kavanaugh and reproductive rights without echoing Harris on such a narrow and questionable point. Democrats are, however, justifiably frustrated by the much larger pattern of deliberate deception that Kavanaugh and his supporters have undertaken in hiding his inclinations on reproductive rights. If the nominee ascends to the Court and fails to help pare back abortion rights precedents, there will be an explosion of outrage from bamboozled conservative evangelicals and other anti-abortion folk who keep telling us they voted for Donald Trump primarily because of his judicial promises, centered on restricting or banning abortion and expanding a religious right to discriminate. Perhaps Brett Kavanaugh poses no real threat to legal contraception (as opposed to legal abortion). But thanks to the wall of silence he and the Republican Party have erected around his actual views, there’s no way of finding out whether or not Kamala Harris and Hillary Clinton are ultimately wrong in accusing him of exceptional extremism. If he is confirmed, we will all have to wait and see.